There are tacky advertisements. And then there's Halo 4: King of the Hill Fueled by Mountain Dew (actual name), a new promotional iOS game that asks you to go to the store and scan in bags of Doritos and bottles of Mountain Dew in order to play. Let me repeat that. You have to scan in bags of Doritos and bottles of Mountain Dew in order to play. Oh and also you battle at 7-11. Win Double XP Matches and Digital Halo 4 Gear! Mountain Dew, Doritos and 7-Eleven - in partnership with Xbox, 343, and Ogmento - are helping bring the Halo 4 experience into the real world with this location-based promotional game! Battle to become King of the Hill at your local 7-Eleven Store to win cool digital Halo 4 gear including Double XP and an Exclusive Custom Locus Helmet (US Only) or Ghost Prop Avatar (Canada Only)! Scan your favorite Halo 4 themed Mountain Dew and Doritos products to get in-game supplies to keep the battle going at each store location! Download and play for free! Location-Based gameplay ties the in-game action to real world 7-Eleven Stores! 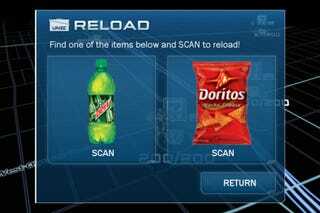 Use Augmented Reality & Computer Vision technology to scan Mountain Dew and Doritos products to obtain supplies! Win Halo 4 prizes for your home console including Double XP matches, an exclusive Halo 4 Theme, a "Bulletproof" Emblem, and a "Locus" Helmet (US Only) or Ghost Prop Avatar (Canada only)! Get Halo 4: King of the Hill Powered by Mountain Dew and join the battle! So, yes. Halo 4: King of the Hill Fueled by Mountain Dew. Society has reached this point. Sometimes I feel like we're living in a Futurama parody of what modern life is like.